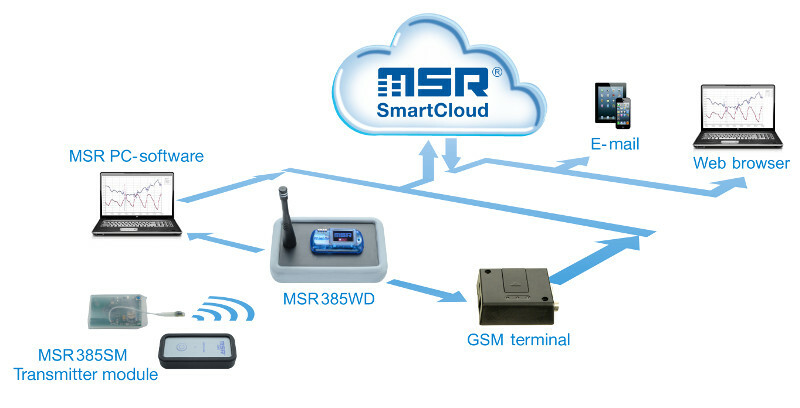 Permanently record temperature, humidity and pressure at various measuring points, in inaccessible locations and at operating temperatures from -20 °C to +125 °C, and monitor them via the cloud: The MSR385WD data logger, which is equipped with wireless sensors and which is available with a GSM terminal, offers these options. The MSR385SM transmitter modules record temperature profiles, humidity and pressure by means of sensors and send the measured values to the MSR385WD data logger in the 868 MHz ISM band, which can be used without a licence. Due to their thermal resistance, the transmitter modules – depending on the type of case – facilitate applications even at high operating temperatures of up to +125 °C. Thanks to their compact case, they can also be placed in locations that are difficult to access, for instance in working machines or inconspicuously in display cabinets of museums. The optimised power management ensures that – depending on the frequency of measurements and radio transmissions – the power supply to the miniature transmitter modules is warranted for up to five years. The centrepiece of the wireless measurement system is the MSR385WD data logger, which is equipped with a memory capacity of more than one million measured values. This multi-channel data logger has an integrated ISM band receiver module through which it receives and stores data from up to ten MSR385SM transmitter modules. The data logger is supplied with power by means of a USB connection; with the integrated rechargeable 2400 mAh lithium-polymer battery, it can be operated autonomously for up to two days. A flash memory safeguards the data security in the event of a power failure. The colour OLED display of the data logger is at your disposal for simply reading the measured values locally from the transmitter modules. With a few clicks you are able to select and request a no-obligation quotation of your desired MSR385WD. Please click here to follow the link to the configuration page on the MSR server or call us on 0422 350 956 and we will assist you to find the correct data logger for your application.